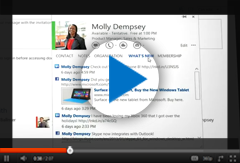 Microsoft Office 365 - cloud services and tools. First, choose a plan that suits you best. Review the plan comparison by clicking here. Check out what options and features each plan includes. In order to select the right plan, consider these factors: the quantity of licenses you will need; if you want the latest Microsoft Office desktop applications or you have it already. If you choose a plan without desktop version of Office, Office 365 subscription will work with the latest version of Office, Office 2010, Office 2007 (with slightly limited functionality), Office 2011 for Mac, and Office 2008 for Mac. See full system requirements here.